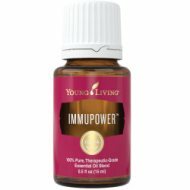 ImmuPower Essential Oil is a blend that may support a healthy immune system*. It uplifts and energizes the mind and body. Diffuse it in your home or office; or barn to support the body's natural defenses. ImmuPower essential oil is definitely a great blend to have on hand at home and at the farm. It is safe to use on humans and animals! This is an easy reference guide for ImmuPower Oil Blend. It will tell you how to use your oil blend and what to use it for. It will also provide you with some fun tips and testimonials! Want to Purchase Therapeutic ImmuPower Essential Oil? What is in ImmuPower? There are nine different essential oils in ImmuPower. They are listed below along with a brief description of each oil. Oregano Essential Oil (Origanum vulgare) The benefits of oregano oil go beyond cooking. Oregano Vitality, when taken as a dietary supplement, supports a healthy lifestyle regimen*; and contains naturally occurring constituent carvacrol. It is a key oil in the Raindrop Technique. Idaho Tansy Essential Oil (Tanacetum vulgare) has been used traditionally for supporting the digestive system*. Listed in E. Joseph Montagna's The Herbal Desk Reference on herbal formulas, tansy may support healthy skin. Mountain Savory Essential Oil (Satureja montana) supports healthy immune, nervous, and circulatory systems*. It has been used traditionally used as a general tonic for the body. Cumin (Cuminum cyminum) may be supportive to a healthy immune system. What are the Documented Uses for ImmuPower Essential Oil? May support a healthy immune system*. Energizing to mind and body. What is the Aromatic Affect on the Mind? Has a spicy, balsamic and warm aroma with incense-like overtones. What is the Spiritual Influence? This oil will help those who give to others so much that they are sacrificing of themselves. It may help those who have obsessive personalities as well. What Chakra is Affected? Opens the solar plexus chakra. Can this oil be used for Animals? Yes! I use it for my dog and the horses. What are the Safety Precautions? Children under 5 years of age should not use this oil. Avoid using on infants and very small children. Women who are pregnant and those who have epilepsy should use caution. Can cause irritation to the skin, therefore dilution is necessary. Diffuse during winter to uplift and energize the body.